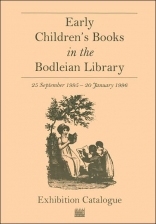 Bodleian Library, University of Oxford is a publisher of children's books. Some of the books published by Bodleian Library, University of Oxford include Punctuation Personified, or Pointing Made Easy by Mr. Stops: A Facsimile, The Douce Apocalypse, Father Christmas' ABC, and Laurel for Libby: A Facsimile Edition of a Small Story Book Written for Graham Greene by his Wife, Vivien.